Uses: A very minor ore of uranium and as mineral specimens. Meta-zeunerite is a dehydration product of its close cousin, zeunerite, hence the name. When the mineral zeunerite loses water and converts to meta-zeunerite, it becomes a pseudomorph. A pseudomorph is generally an atom by atom replacement of one mineral's chemistry in place of another mineral's chemistry, while the crystal's outward shape remains largely unchanged. The process leaves the crystal shape of the original mineral intact, but the original mineral is not there. Pseudomorph translated means false shape (pseudo=false; morph=shape). In this case, the conversion is not so dramatic since it involves only the loss of a few water molecules; therefore, a good pseudomorph is likely. The conversion is irreversible and ongoing, and all collection specimens of a certain age are almost certainly partially to totally converted. If accuracy is demanded, all zeunerite collection pieces of a few years of age or more should be labeled as meta-zeunerite. Meta-zeunerite can be found naturally in nature, but probably started out as zeunerite. The structure of meta-zeunerite is composed of arsenate tetrahedrons linked to uranium-oxygen groups that form distorted octahedrons. The arsenates and uranium groups form sheets that are weakly held together by water molecules. This structure produces the tabular habit, the one perfect direction of cleavage, and the relative softness. It is an analogous structure to that of the phyllosilicates. Remember, this is a radioactive mineral and should be stored away from other minerals that are affected by radioactivity and human exposure should always be limited. Colors vary from pale to dark green. Crystal Habits include tabular square crystals dominated by two pinacoid faces. Bipyramidal crystals are also seen. Crystals can look cubic (pseudocubic) too. Also as crusts, micaceous, foliated and earthy. 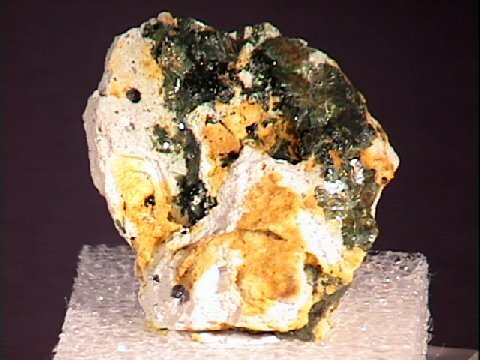 Almost all meta-zeunerite crystals are pseudomorphs of zeunerite. Specific Gravity is approximately 3.85 (above average for translucent minerals and higher than zeunerite due to loss of water molecules). Other Characteristics: Radioactive, non-fluorescent and cleavage sheets are surprisingly brittle. Associated Minerals are barite, fluorite, quartz, limonite, olivenite, brochantite, scorodite, meta-autunite, meta-torbernite, heinrichite, uraninite and other uranium minerals. Notable Occurrences include Centennial Eureka Mine, Tintic, Utah; the Kern River uranium deposits in Kern County and near Crystal Peak in Plumas County, California and the Grandview Mine and other unanium localities in Arizona, USA; Weisser Hirsch Mine, Schneeberg, Saxony, Germany; Wheal Edward Mine, Cornwall, England and other localities with uranium arsenic minerals. Best Field Indicators are color, crystal habit, non-fluorescence, higher density than zeunerite, radioactivity, associations, cleavage and brittle cleavage sheets.